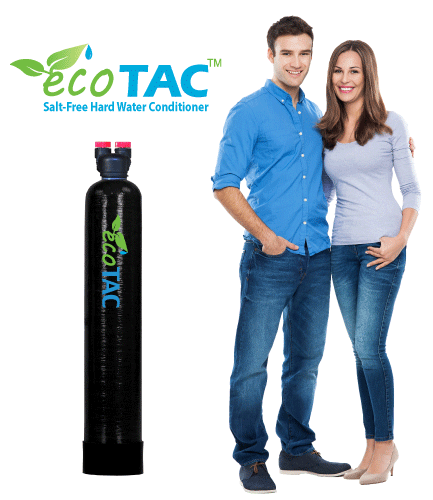 Our ecoTAC™ hard water conditioners use a salt-free water treatment technology called Template Assisted Crystalization ("TAC" for short) to prevent hard water scale problems in your plumbing system, appliances, and more. 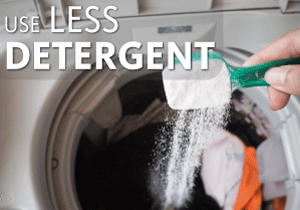 Some of our competitors incorrectly refer to this technology as a "salt-free water softener." ecoTAC™ salt-free hard water conditioners are an environmentally-friendly alternative to traditional water softeners to prevent hard water mineral scale from coating surfaces inside your plumbing system, water heater, dishwasher, and other appliances. Unlike a traditional water softener, ecoTAC™ conditioners do not require regeneration with salt, backwashing, or expensive electronic control valves. Accordingly, they require almost no maintenance and are easier to install. What makes ecoTAC™ better than other TAC units? More power! The media is the most critical part of the system, but it is also the most costly, so many of our competitors reduce the media volume to cut costs. More media means more performance and longer life. We give you roughly 15% more media! Hard water scale always precipitates onto something. It does not readily form on its own in the water stream. The scale has to find a surface (wall of a pipe, a water heater element, etc.) to serve as a nucleation seed to form onto. ecoTAC™ salt-free hard water conditioners use a highly specialized media consisting of polymeric beads which serve as a powerful catalyst for the formation of nano-crystals of calcium and magnesium carbonate that remain suspended in solution instead of forming hard mineral scale on surfaces. Some of our competitors refer to salt-free hard water conditioning as a "salt-free water softener." While this is technically not correct, this technology does provide most of the same benefits of a water softener. The process by which a salt-free hard water conditioner works is called Template Assisted Crystallization, or "TAC," (sometimes referred to as Nucleation Assisted Crystallization or "NAC"). It is widely recognized as the most effective alternative hard water treatment. When water begins to flow into the bottom of the treatment tank, the TAC media is lifted and dispersed throughout the treatment tank in a fluidized bed which enhances contact with the calcium and magnesium ions in the water. A contact time of only 5 seconds is required for the treatment of up to 25 grains per gallon (approx. 425 ppm or mg/l) of hardness. Since the system is operated in a fluidized upflow configuration, the system will not clog with sediment and no backwashing is required. The nucleation sites on the TAC media attract calcium, magnesium, and bicarbonate ions. At these template sites, these building blocks of mineral scale combine to form microscopic (nanometer-sized) calcium carbonate and magnesium carbonate crystals. However, instead of forming typical calcite crystals (normal mineral scale), the template surface guides the formation of a crystal structure that does not stick to surfaces. As the crystals grow, they break off and become suspended in the water stream and are carried away in a crystal form that is stable, and does not easily revert back to its dissolved form or stick to surfaces. If the water is allowed to evaporate on a surface, such as a glass shower screen, the crystals will be deposited and will leave a spots the glass since the minerals are not actually removed; however, they should be easy to wipe away as they will not stick to the surface. During the first few weeks after the installation of an ecoTAC™ conditioner, a de-scaling effect (whereby existing hard water scale built-up in the plumbing system is released) will often occur. 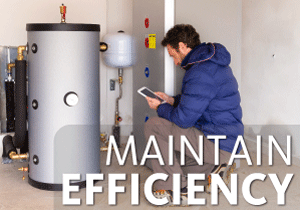 Over time, this added benefit will enhance performance of water heating equipment and restore flow performance of plumbing fixtures. TAC technology was first employed as an alternative to conventional water softeners roughly 15 years ago in Germany. It was introduced to the U.S.A. and Canada about 7 years ago and has gained widespread acceptance. Testing performed by the German Technical and Scientific Association for Gas and Water (DVGW) according to the Standard W512, determined the TAC media to be 99.6% efficient in preventing hard water mineral build up on the test heating coils and pipes. 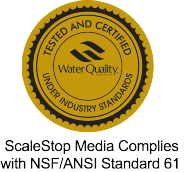 Standard W512 is considered to be the most rigorous accreditation standard for certifying water softener alternatives for scale-reduction performance. A study conducted in 2011 by Arizona State University entitled, "Evaluation of Alternatives to Domestic Ion Exchange Water Softeners," backed these results. It determined that TAC technology was the most effective of all non-salt water conditioners at preventing mineral scale, with reduction levels consistently in excess of 90%. The results showed that TAC conditioners were far more effective than magnetic and electronic water conditioners at preventing hard water scale formation. This study also used the DVGW Standard W512 test protocol. ecoTAC™ conditioners operate in "upflow" so they do not trap sediment or suffer from channeling, which reduces the effectiveness of competitors' products. Backwashing is not necessary. 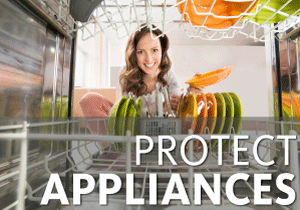 The only required maintenance is to replace the TAC media roughly every 3 to 5 years. Some competitors suggest that their TAC media can last even longer; this is generally unrealistic. We would rather give you honest expectations based on real-life typical conditions, not overly-optimistic expectations that only a few people will experience. We recommend that you budget for media replacement every 3 years on well water or 5 years on city water to be conservative. The replacement of the TAC media is quite straight forward and takes about 30 minutes. The presence of elevated levels of chlorine, iron, manganese, hydrogen sulfide, copper, and certain other contaminants can damage TAC media, reducing its effectiveness and shortening its life. While the media can handle the typical chlorine levels found in municipal water sources, to maximize media life, it is generally recommended that chlorinated city water be pre-filtered through activated carbon to remove free chlorine before the TAC system. Pre-treatment is required if any of the parameters noted below are exceeded. We have designed our ecoTAC™ systems for ease of installation. We provide a bypass valve with each system and 1" male NPT threaded fitting connections for the inlet and outlet. Optional John Guest style quick-connect (push-in) fittings are available at extra cost for easy connection to copper or PEX lines. If your water lines are less than 1" diameter, you will require basic couplers to expand to the 1" connections. These are readily available at any hardware store. The ecoTAC™ conditioner is designed to be installed after any treatment for iron, manganese, hydrogen sulfide, sediment, and chlorine, but before a UV disinfection system and before a chlorinator (if equipped). Polyphosphate feeders should never be placed before a TAC conditioner. TAC treatment should also be done prior to any water heating equipment. 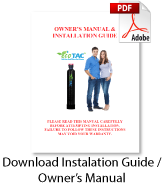 We recommend that ecoTAC™ systems be installed by a licensed plumber; however, your warranty is valid as long as your system is installed in accordance with local plumbing codes and the Owner's Manual. Hope after while since we talked, this email finds you well. I am still so appreciative of your help and patience with me. Love the ecoTAC. Had it just over 3 years. Still works fine..... Thanks for your help as usual! ....Plus [water] tastes great:) Pretty cool:) - A.P. My wife remarked that the water feels soft from this water conditioner! We are very pleased that we see no lime or cam Jim deposits whatsoever on our fixtures and do in. All of this without purchasing salt!!!! Very happy and these folks are pleasant to deal with! - Bob T.
Salt-Free Conditioning Media Next Filtration Technologies Inc.
ecoTAC™ systems are backed by a comprehensive warranty program. *Note: Due to the wide variety of potential feed water conditions, there is no warranty on the ScaleStop media.